Nano, formally known as RaiBlocks is a cryptocurrency that has a low latency and is trustless. It relies on a block-lattice architecture that is novel with each account having its own blockchain. Consensus comes from the delegated proof of stake (PoS) voting. With Nano, users get unlimited scalability plus instantaneous transactions without fees. That lack of fees is possible thanks to the minimal resources required by the network, including no requirement for high-power mining hardware. According to its website, the Nano network so far has processed more than 4 million transactions. This is even more impressive considering that the unpruned ledger is just 1.7 GB. 2 How Do Users Take Advantage of Nano? 4 How Does Nano Improve on Existing Cryptocurrencies? 5 What Should You Know about Nano Tokens (XRB)? 8 How Does the Consensus Work? 9 What Is on the Roadmap? 10 How Can You Contribute to Nano? (“Is it, ray or rye?,” “Ditch the Blocks!,” “Just call it Rai!”). Feedback from the community suggested that improvements could be made to better resonate with the public and a mainstream audience. The block-lattice structure of Nano sets it apart from other conventional blockchains used for cryptocurrencies. Every account has an account-chain blockchain that is the balance and transaction history. Only the account owner can update the account-chain, which means that updates are asynchronous and immediate, allowing for quick transactions. Because blocks must be added by the account’s older, moving funds does require two transactions instead of one. The sender must add a send transaction while the receiver needs to complete a receiving transaction. The biggest advantages of Nano are its lack of fees, scalability, and instantaneous transactions. Because of the lightweight protocol, there are no fees for transactions. Additionally, transactions are taken care of independently, with each transaction fitting with a UDP packet, preventing block size-related problems. It is also highly scalable thanks to the use of logarithms of data sets using tree-like structures. Finally, the transactions are instantaneous since they precache the system’s anti-spam proof of work (PoW) to use with the following transaction following completion of each transaction. There might still be a delay for an ongoing transaction, but that helps prevent spam. How Does Nano Improve on Existing Cryptocurrencies? Bitcoin is the most popular cryptocurrency, but Nano has a significant advantage over it in terms of transaction time. A typical Bitcoin transaction requires processing with orders of hours. This is because the average block processing time is 10 minutes and because a transaction has to be within a block and have that block mined to go through. Most of the time, several blocks must be added before a transaction is considered complete. By comparison, every single transaction on Nano is a block and the network can instantly process that block. It also takes a unique stance on security via the delegated PoS. To make a malicious attack, an attacker needs over 50 percent of the voting power. This would, however, require them to have more than 50 percent of the XRB tokens, something that requires a lot of funds and makes it financially unwise to attack it. Additionally, the delegated PoS system allows for minimal energy consumption and for full nodes to run using low-power and inexpensive hardware. What Should You Know about Nano Tokens (XRB)? The tokens were first distributed in October 2017, and you cannot mine XRB. It is already at the maximum supply, 133,248,290 XRB. If a website says it mines XRB, it mines another cryptocurrency and then pays out the miners using XRB. At the moment, you can trade for XRB on Kucoin, Bit-Z, BitFlip, Bitgraill, and Mercatox. The team is working to expand this list. 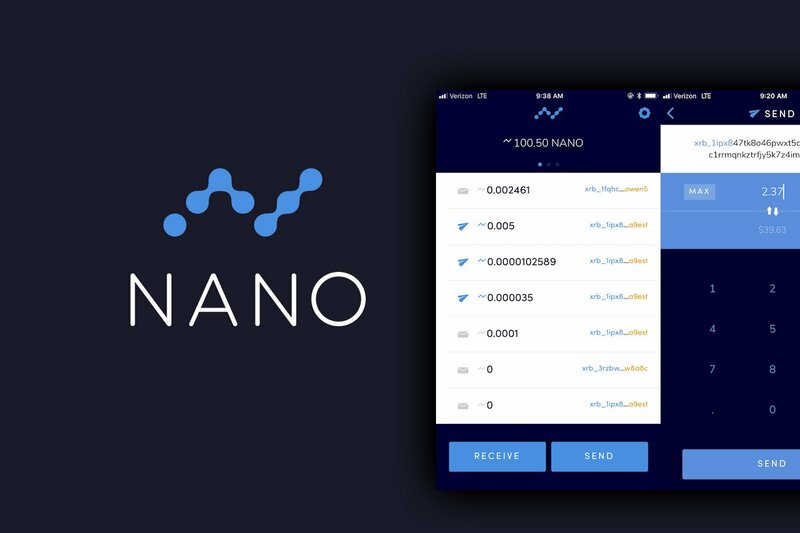 There a number of official Nano Wallets available to download from the official website. They have an online web-based wallet, official iOS and Android apps and also a desktop client so you can choose which one suits you best. You are not able to purchase XRB with “Fiat” currency so you will need to first purchase another currency – the easiest to buy are Bitcoin or Ethereum which you can do at Coinbase using a bank transfer or debit / credit card purchase and then trade that for XRB at an exchange such as Kucoin. To purchase Nano, you will need to send your Ether from Coinbase to an exchange and trade for XRB. You can now send your Ether over to Binance to make your purchase of XRB, take a look at our review of Binance here to see how to signup and purchase on their exchange. How Does the Consensus Work? Voting on Nano is based on account balances, with the greater your balance, the more weight for your vote. The team feels that this makes sense, as those with a greater amount of funds in the system already have an incentive to keep it honest: protecting their assets. By comparison, other cryptocurrencies, like IOTA, determine their consensus by stacking consecutive transactions with PoW. This PoW stacking needs a maximum continuous hash rate on the record, which users end up paying for via the electricity cost. Since it doesn’t need the PoW for security or a consensus, the operating costs are significantly lower. The Nano roadmap has more specific goals listed for the final three months of 2017, wrapping up the year with such things as beta testing and releasing the mobile wallet and developing partnerships and merchant services. In 2018, the team plans to develop the previously mentioned light wallet and add chain pruning to reduce the size of the chain. In terms of the community, the team hopes to keep adding exchanges and enhance the block explorer. Major goals for the future include the protocol becoming an internet standard that is controlled by a diverse grouping of people from various areas instead of a single person or small group. The team also wants to add IPv6 multicast to the transaction broadcasting so everyone who wants to can see the announcement for a transaction. The team hopes to have current payment providers accept the XRB tokens just like they would a fiat currency. Nano also wants to help the large population of unbanked people. These people will hopefully get the assurance that the payments they receive will be secure at their exchange point. How Can You Contribute to Nano? Since the token distribution ended months ago, there is no ICO to contribute to financially. Instead, you can contribute your resources to Nano. If you want, you can run a lite node with just a fixed maximum portion of disk, bandwidth, and CPU. Or you can allot more disk space and run an audit node. For those with reliable internet connections and dedicated processing power, you can run a representative note. Developers are also welcome to contribute their skills. Unlike many other cryptocurrencies on the market, Nano has already shown a great deal of progress and is fairly far along in its roadmap. Although the market is arguably oversaturated with cryptocurrencies, the lattice architecture of Nano makes it a welcome addition. This structure provides benefits that should appeal to users and lead to an increase in popularity for Nano over time. You can use nanowallet to store raiblocks,xrb, NANO. When Nano will be available on Bitpanda?